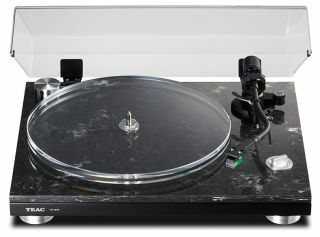 TEAC unveils TN-570 flagship turntable | What Hi-Fi? TEAC’s new belt-drive deck comes with a new S-shaped tonearm and a system that claims to mimic the accuracy of a direct-drive turntable. The S-shaped tonearm sports a light alloy headshell to make swapping cartridges quick and easy and is height adjustable to compensate for different cartridge sizes. TEAC supplies the deck with an AT100E MM cartridge. It features an electronic speed change too, saving you the hassle of removing the platter to manually change the position of the belt. TEAC has also fitted its new Platter Rotation Sensing Servo System, which uses an optical sensor to “deliver a rotation precision that’s almost the same as you’d get with a direct-drive deck”. TEAC claims that no other analogue belt-drive deck in the same class offers this system. A 16mm clear acrylic platter sits atop the artificial marble/MDF plinth - both materials have been used for their ability to reduce unwanted resonances, says TEAC. You also get a a built-in MM phono stage, alongside an optical output that supports 24-bit/192kHz audio. The TN-570 is available now in black for £749. A second turntable, the TN-550, is available without the digital output stage and will be available in certain markets only for £550.